Ah, the video game compilation. Every few years we see them, bundling games of yesteryear for a budget price. We’ve seen them for Mega Man, Street Fighter, Mortal Kombat, Super Mario Bros, and so on. Lately we’ve even seen Re-mastered collections for Uncharted, God Of War, Gears Of War, Halo just to name a few. Over the years we’ve seen a lot of collections centered around the Golden age of consoles. Especially the Atari 2600. PROS: Online multiplayer. Content for enthusiasts. 100 games! CONS: There could have been some better titles included. Limited controller options. PADDLES: Sadly, nothing has compared to them in nearly four decades. So what makes Atari Vault stand out from other Atari 2600 compilations that have come, and gone over the years? There are actually a few nice features here. This is one of the biggest compilations of Atari games yet. In the past we’ve seen a disc of 20 games or a disc of 80 games. Usually dumped ROMs in a sub par emulator for whatever platform. The game shows up in stores, you pick it up. Done. Every so often a better than average one would show up with nicer emulation, and maybe some historical backgrounds. Other times there would be a terrible remake bundled with the original game. Atari Vault doesn’t feel slapdash at all. You get 100 games. Some of which are not Atari 2600 games, but Atari arcade games. Right away this shows that effort went in. Why? Because Atari actually had a complicated history after the crash of 1983/84. The company was originally founded by Nolan Bushnell. Eventually Time-Warner (Warner Bros.) bought the company from him. But when the crash happened, Atari was essentially broken up into two entities. Time-Warner sold the home division to Jack Tramiel. He had been ousted from Commodore, the company he founded. So from 1983 to around 1997 his family owned the half of the company that made the 2600, 5200, 7800, Lynx, and the Atari Jaguar. As well as a long line of successful computers 400/800, XE, and ST. Time-Warner still owned the arcade division which they eventually sold to Midway. When Midway exited the arcade business Atari Games became Midway Games West. In a bit of irony, when Midway hit hard times they ended up being bought out by Time-Warner. Of course after the Jaguar tanked, the Tramiel family ended up selling Atari Corporation to JTS, a hard drive manufacturer. JTS started to flag, and sold Atari to Hasbro. When Hasbro had no success with it, they sold it off to Infogrames, who changed their name to Atari. In short, there were probably many months figuring out what Time-Warner has the rights to, what Infogrames/Atari has the rights to, and what may have slipped between the cracks. So it is pretty astonishing to see that this collection does give you both, arcade, and 2600 games to play. That being said, this is also the reason why you may not see some of your favorite games included. It’s disappointing. But at least it is understandable. Still, with 100 games in the compilation you’re bound to find several you do like. There are the commons like Combat, Flag Capture, Canyon Bomber, Haunted House, Breakout, and Warlords. Interestingly, they also have a couple of prototypes, and unreleased 2600 games included here. 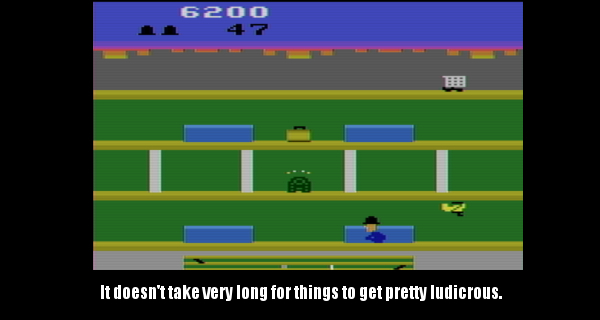 There are even a number of uncommon games that came out near the end of the 2600’s long life cycle. Basically you have over a decade of 2600 history here. But the inclusion of the arcade games is another big reason you might consider picking this collection up. You get a pretty good selection of them, and many of them were games that used a Trackball. Missile Command, Centipede, Millipede, and Crystal Castles are here in their glory. What’s really nice is that you can play these with the mouse. If you happen to have a trackball mouse you’ll definitely love playing these. The developers at Code Mystics have gone above, and beyond too. Because they retooled their emulator’s inputs to mimic the response time of the arcade machines’ trackballs. So if you have a high dpi setting, expect to see some lag if you spin your cursor around thinking you’re going to have an edge. You’re not. The games really do play pretty close to the original machines. Only the players with an encyclopedic knowledge of how those games played will really see a vast difference. They play great. Every game in the collection does. On top of this, every game has the appropriate machine decals bordering the screens, and there are even start button models displayed below to make things feel as authentic as possible. But the extra hard work doesn’t end there. They painstakingly tracked down Atari arcade cabinet art to scan in. The arcade manuals, and flyers are here to read. The arcade machines themselves, are modeled, and animated as you select what game to play. This carries over into the 2600 games too. Each 2600 game featured here has a box model textured with the original retail box art on it. Front, back, and spines. They also managed to track down every manual for every cartridge featured in the collection. So when you go to look at the controls, you’ll actually be seeing scans of the manual that came in the box when the game came out. They even have the original 1977 console manual scanned in here. They didn’t just dump ROMs into an emulator, and call it a day. They put in a lot of historical research, and time into getting a nice presentation down. If all of that isn’t enough for you though, Atari Vault also has internet multiplayer. You can play all of the games in the collection against other people. For most of the games you’ll still prefer playing these games the way we did 30 years ago, computer hooked up to the Television, with controllers. But for some of the games like Combat, internet multiplayer can actually make things feel fresh. It’s pretty great, and in my tests I didn’t run into much in the way of lag. It’s really worth checking out. If I had any complaints with the compilation it would have to be with the controller options. Every game will have different ways you can play depending on the title. Most of them will let you play with the keyboard, and the arcade trackball games give you the aforementioned mouse option, which again, works great. But Code Mystics doesn’t seem to like to put in options for a variety of game pad controllers. If you have an Xbox 360 controller, you’re gold. That controller works flawlessly. But no matter how hard I tried, I couldn’t get the game to see my Steam controller, nor could I use my USB Retrobit controller, which is a perfect fit for collections like this one. These were the developers behind porting Mortal Kombat Arcade Kollection to the PC, and I had the same complaint with that compilation. If you want to use a controller, you pretty much have to have Xbox 360 controllers. The other problem, which I can’t really levy at Code Mystics, is that nothing compares to a paddle controller. You can play classic 2600 games like Warlords, and Demons to Diamonds with a mouse, keyboard, or Xbox 360 controller but none of them will give you the feel of a paddle. Paddle controllers had a dial that you would use to move your character, and it just has a spot on, responsive feel that nothing has replicated in almost 40 years. About the closest you can get is using the mouse controls, which I would implore you to do. These games simply don’t feel as responsive using a game pad or a keyboard. A mouse will give you the precision you need, even if it does come up a little short in the feel. 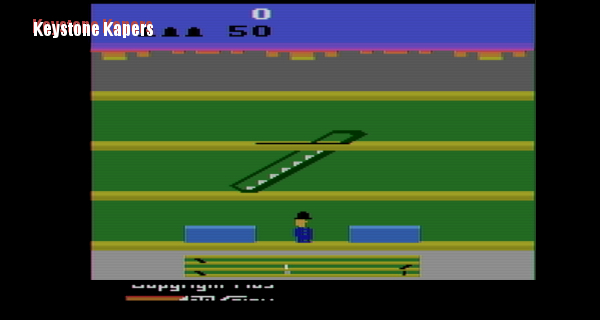 If you played a lot of Circus Atari as a child, it is still a lot of fun to play here, but it might take you a few rounds to get accustomed to using something else. Overall though, I highly recommend this collection. True, the selection of games could stand to be a little bit better. But considering the history of the company, and the rights hell some of those games may fall under it is understandable. There are a lot of good games here anyway. The internet play reinvigorates some of these titles, and finally having a legitimate way to play classic arcade games like Centipede is a boon. It’s a great bundle for older fans who might not have their physical 2600 collection anymore. It’s also a great bundle for younger fans who are interested in what came before. While not every game featured here has held up, most of them have stood the test of time with their rock solid game mechanics. These games are fun. If you’ve played them before, revisit them again. If you’ve never played them because you weren’t around for them, have an open mind. Check them out, you might be pleasantly surprised. Just make sure you have some Xbox 360 controllers for the games that didn’t use a trackball. Last time on the blog we looked at Atlantis. A game that combined defending the lost city during its death throes with classic arcade action. But this time we’ll be going over the sequel. Cosmic Ark plays completely differently than the previous game. None of the skills you learned from the previous game will help you here at all whatsoever. But fear not! It does continue where Atlantis left off. PROS: Experimental game ideas gone right. CONS: The planetary defense system. SPACE NOAH ADVENTURES: ABDUCTION: Could have been an alternate title. Remember the little ship that flew away when you finally lost in Atlantis? Well it’s actually a mothership, and it turns out that now you have to rebuild your civilization. How do you do this? By taking a page from the Old Testament, and rounding up pairs of living things. As well as sentient beings. Cosmic Ark merges Noah’s mission of preserving civilization in the wake of a cataclysm with episodes of Unsolved Mysteries. In fact you might even want to play this game while the Unsolved Mysteries theme song is playing. It did have a number of episodes centered around U.F.O. sightings, and alien abduction stories. It was one of the creepiest shows on television. But I’m getting away from the topic at hand here, so I’ll refocus. Cosmic Ark is broken up into two stages. A space stage, and an alien abduction stage. Both of these stages alternate until you lose. Once again, this is a game about high score. In the space stage your mothership is in the center of the screen. You can shoot lasers above you, below you, and on either side by moving the joystick up, down, left, and right. Asteroids will appear in any direction, and you have to shoot them all. If an asteroid hits the ship, it explodes, and you have to play the stage again. You’ll keep going until the red meter below your score runs out, or until you complete the stage. Every collision drains part of the meter. Explode too many times, and it’s game over. But if you succeed, you’re sent down to a planet’s surface. In this stage you pilot an away team in their own saucer. You’ll leave the mothership, and fly down to beam up two inhabitants. Once you have them on board, you fly back into the mothership, and go back into space, where you’ll play another round of the space stage. But things don’t go so swimmingly as the game progresses. Every time you make it back to the first stage, the asteroids become faster, and the order becomes even more random. Eventually you’ll get to a point where it’s impossible to continue, and you’ll have to accept your final score. The second stage becomes more difficult in a few ways. For one thing, if you don’t abduct beings fast enough, the mothership will sound an alarm. If this happens, you need to quickly get into the mothership, and shoot down asteroids so you can leave, and go back into space. If the ship is hit, you go back to the space stage anyway, but with a much lower bill of health. Successive trips to planet surfaces will reveal planetary defense systems. Laser guns will raise, and lower from the left, and right to shoot down your scout ship. If you get shot down you can send another before the alarm goes off. But note that if you are shot down, anyone you’ve abducted will fall to the ground, and you’ll need to abduct them again. So what you’ll need to do is act fast, and abandon the mission when you hear the alarms. Otherwise you risk your mothership from being destroyed. Worst case scenario is you’ll repeat the same planet after the following space stage. Each planetary visit will change-up the kinds of organisms you’ll need to abduct too. Of course, you will, again, get to a point where you’re unable to ward off asteroids, giving you a final score. Fortunately the game controls very well, and is pretty easy to get the hang of. Cosmic Ark stands out from the hundreds of other Atari 2600 games because of just how bizarre it is. Most other sequels will give you more of what you loved about their predecessors. Cosmic Ark takes chances with some weird ideas. But as crazy as it’s going to sound, it’s a lot of fun to play! Part of the fun is obviously the challenge of it all. But it’s also great trying to see what the people of each planet are going to look like. Kidnapping people in a makeshift attempt to rebuild your empire shouldn’t sound compelling. But somehow it is in Cosmic Ark. Demented. Twisted. But somehow a great time. If you have an Atari 2600, pick it up. In the end you’ll lose, but once again, there’s a backup plan. When the mothership explodes, your scout ship survives the blast. One can only wonder how things would have gone if this had become a trilogy. 15 years ago or so, there began a craze. Companies like Jakks Pacific, ATGames, and a handful of toy companies decided to make game systems out of controllers. These systems were basically systems on a chip. A small board, with a bunch of ROMs on them, usually run under some sort of emulator. But they were often a step up above those bootleg contraptions we’ve all seen at one time or another. These didn’t skirt around copyright law either. Most of them went to the original publishers, and paid for the rights to resell these games in their units. There were joysticks with classic Namco games built in. There were controllers with Midway games in them. There was even an EA Games pad with old Sega Genesis ROMs of Madden inside. But in that sea of joysticks lied one TV game controller you most definitely ought to own. PROS: 30 games in a controller. Modifiable. CONS: Joystick could have been a little bit better. REGIONAL DIFFERENCES: NTSC, and PAL have slightly different game rosters. The brainchild of Jeri Ellsworth, the C64 Direct To TV is one of the best devices of its kind. Originally sold through the QVC Television shopping network, and the now defunct Kay Bee Toys this system was, and is awesome. When you turn the system on you’ll have the option to play 30 different games on it. The system was also sold in Europe, where it is almost the identical. The differences being that the EU version is set up for a PAL signal, and that there is a minor difference in the library due to publishing rights. Among the thirty games though you’ll see some of the better titles put out by Hewson, and EPYX. Including both Cybernoid, and Cybernoid 2. Firelord is also here, along with Jumpman Junior, Tower Toppler, even the Impossible Mission games. Best of all, you really don’t have to be familiar with the BASIC interface of the Commodore 64. This was designed in a way that requires no typing in of LOAD or SAVE commands. Nor do you have to worry about the odd SYS or POKE commands. Turn on the unit to find it auto boots to a launcher. Pick your game, and play away. More importantly though, the games here don’t run under an emulator. The C64 DTV runs on a custom board but uses both SID and VIC-II chips for authentic Commodore sound, and video. So how do the games themselves run? Pretty favorably. Everything seems to run about as it would on an actual Commodore 64. Except as the games are preloaded, you won’t be dealing with any load times. The joystick the system is built in is pretty solid. Things feel sturdy. You won’t feel like you’re going to break it if you move it. The joystick also re centers itself nicely. If you stop moving, it stops moving. All in all, it isn’t too bad, and feels a lot better than most of these other “Compilations in a joystick” products. But it isn’t perfect. Some games like Jumpman Junior require spot on, pixel perfect movement. The joystick here may sometimes shift you left, coming off of a ladder. Leading to an unintentional suicide when you fall to your doom. Still, when compared to a lot of these other contraptions, the C64 DTV fares much better, doesn’t feel gimmicky, and has one huge edge over all of them. If you’re willing to do some tweaking, and are also willing to risk damaging the system should you fail. It is entirely possible to turn this unit into a nearly fully functioning Commodore 64 computer! Doing this opens you up to being able to run the lion’s share of C64 games. Just remember this is going to be for the advanced home brewer only. It requires a lot of soldering, rewiring, and electrical knowledge. But if you have the time, and the guts there are a number of Commodore enthusiast sites that have guides on how to do just that. But even if you don’t want to do any of that, this is still a great device. Especially if you’ve always been curious about Commodore 64 games, but aren’t sure you want to invest in collecting the computer, peripherals, floppy diskettes, and cassette tapes. It’s also nice if you’re a collector who lives in the USA because some of these games were only released in Europe when they came out. As far as these compilation systems go, the C64 DTV is one of the best. Activision. There was a time when that wasn’t a name met with the same ire of Electronic Arts. These days, Activision is known as “Those guys who publish Call Of Duty, and sometimes Guitar Hero or Tony Hawk.” to many people. But there was a time when the company was very different in its business. Back in its infancy, Activision was helmed by a lot of people who created games in-house, and took chances. Oddly enough, a lot like Electronic Arts’ early days they wanted to make sure game creators were credited like authors or musicians. Formed by many people who used to work for Atari, Activision was one of the earliest third-party developers, and made games that really pushed what the Atari VCS could do. Some of these games like Pitfall!, Kaboom!, and River Raid were so huge, that even today people hold them in high regard. Many an Atari, Colecovision, Intellivision, or home computer game collector are sure to have them in their collections with good reason. But Activision also took chances on some ideas that weren’t typical of the time period. One of those games is Keystone Kapers. CONS: High Score gaming may not appease some players. KILL SCREEN: One of the 2600 cartridges that you can become too good with. Programmed by Gary Kitchen (who did a lot of great work in Activision, and Absolute) Keystone Kapers is certainly a game that while adored when it came out, somehow isn’t mentioned much when talking about Activision’s glorious run in the golden age of consoles. But Keystone Kapers is worthy of all of the love it received in 1983, and it’s a cartridge anybody who collects old games should try to track down. Keystone Kapers puts you in the role of a police officer named Keystone Kelly. A criminal named Harry Hooligan has broken out of prison, and run into a shopping mall where he plans to do more larceny, and escape the long arm of the law. Unfortunately Harry Hooligan isn’t all that bright. Because he doesn’t even stop off to change his clothes, or appearance. He just decides to go for a heist the second he breaks out of prison. Anyway Keystone Kelly arrives at the mall, and has to arrest Harry Hooligan before he can get away. You start the game as Harry runs away. As stated before, your job is to arrest him as quickly, and efficiently as possible. At first, you’ll find he’s a really easy criminal to apprehend. But once you bust him, the game gives you the same task only each time Harry starts throwing more, and more obstacles to hinder you. Each time he gets away, or you fall victim to one of his traps you lose a life. You start the game with three lives, and you can earn bonus lives by scoring big points. Every 10,000 points nets you another life. How do you get points? By having time left on the clock when you catch Harry. The more time you have left, the bigger the point bonus. You can also pick up suitcases of money, and bags of money for around 50 points. In earlier stages you’ll get around 100 points multiplied by time left over, and later stages it can jump to 200 points, and then 300 points. 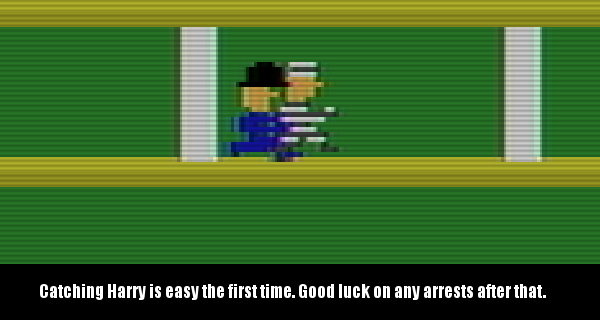 With every arrest you make, the game becomes more, and more difficult throwing all kinds of obstacles at you. Some items like shopping carts will cost you time if you hit them. Most other ones will take your life. Bouncing balls, model airplanes, and carts are the main traps you’ll run into, though there are others. To ensure that you run out of lives, each round not only adds more to impede your progress, but speeds them up as well. So while jumping over a cart the first time you see one may seem fairly easy, later levels will send them at you 100 miles an hour. Keystone Kapers can become really difficult, really quickly. The game does throw one major bone your way though. That is a radar screen at the bottom of the TV screen. 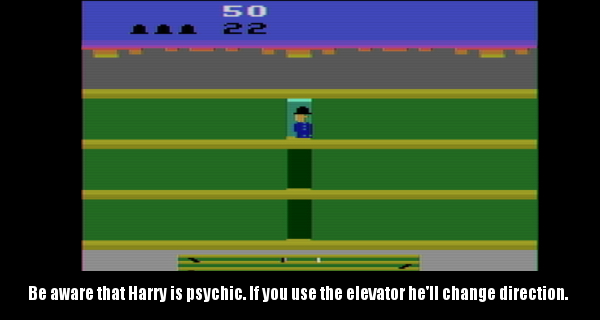 As you hunt down Harry by using escalators, an elevator, and your platform jumping skills it will tell you what floor he is presently on. Just remember Harry has a few cheap things he can do to you. First, if you chase him on the roof, he leaves you no way to go back to the lower floors. So you had better catch him if you follow him to the roof. In many cases the game leaves you no choice but to go to the roof. But note that if you miss him, he can get to lower floors. Second, Harry also has the strange ability to go down floors without using the escalator or elevators. Third he is also immune to his own booby traps of merchandise. The game has no soundtrack, or many audio effects for that matter. Getting hit makes noise. Scoring points makes noise, and jumping makes noise. That’s about it. But the game has the same visual hallmarks Activision was known for on the 2600. Graphically, it is one of the better looking games on the console, utilizing some great tricks to simulate the elevator, and escalators. It also runs at a pretty great clip with no slowdown, even when the game throws a ton of stuff at you. The only issue I ever had is the precision entering an elevator takes. It requires pixel perfect placement, and timing. The 5200, Colecovision, and computer versions look even better. Adding more details to the shops you chase Harry Hooligan through. All of the versions run fairly well, though the 2600 version, and computer versions tend to have the best controls. While the game isn’t very long given it’s a game centered around a high score, it is really engaging. Like Donkey Kong before it (Which Gary Kitchen also ported to the 2600 for Coleco), it may be simple to pick up, but the challenge can keep you playing for hours if you’re willing to let it. If you find yourself looking for a really fun classic game with staying power, track down a copy for yourself.